The ninth Annual Ceremony for The Muslim News Awards for Excellence took place 30 March 2009 in London. 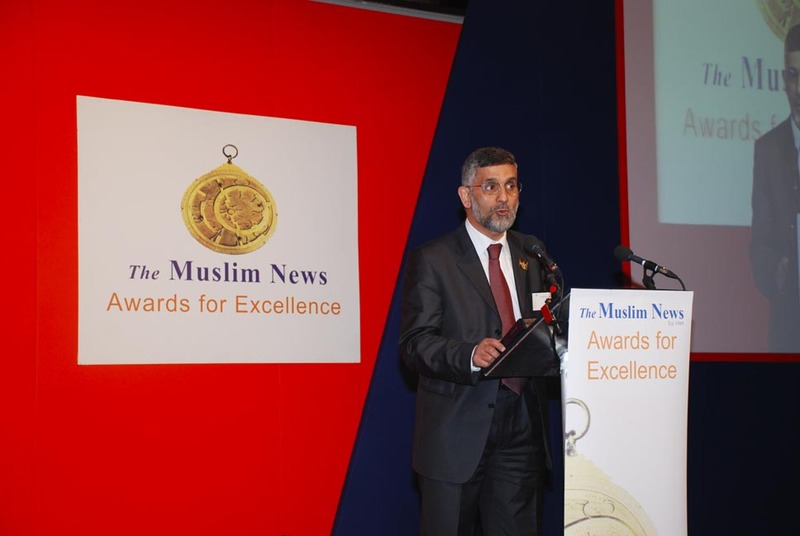 Over 800 people celebrated the ninth Annual Ceremony of The Muslim News Awards for Excellence - Britain's longest standing Muslim awards event. The coveted award ceremony recognised the very best of Muslim contribution to British society. On this occasion, Professor Mohamed El-Gomati, Deputy Chairman of the Foundation for Science, Technology and Civilisation (FSTC), was awarded Fazlur Rahman Khan Award for Excellence in Engineering, Science and Technology. Figure 1: Professor Mohamed El-Gomati receiving the Fazlur Rahman Khan Award for Excellence in Engineering, Science and Technology. The presenter is Professor Mark Welland, FRS, FREng, University of Cambridge. The ninth Annual Ceremony for The Muslim News Awards for Excellence took place 30 March 2009 London at Grosvenor House, Park Lane, London. Over 800 people celebrated the ninth Annual Ceremony of The Muslim News Awards for Excellence - Britain's longest standing Muslim awards event. The coveted award ceremony recognised the very best of Muslim contribution to British society. The Guest of Honour Cardinal Cormac Murphy-O'Connor, the Archbishop of Westminster, said: "In a short space of time the Awards have established themselves as a significant event for the Muslim community." Special guests included Home Secretary Jacqui Smith, Communities Secretary Hazel Blears, Shadow Justice Secretary Dominic Grieve and the Liberal Democrats Leader Nick Clegg. They were joined by civic and religious leaders, as well as representatives from the worlds of politics, business, sport and the arts, to honour unsung heroes and heroines of the community. Prime Minister Gordon Brown described The Muslim News Awards for Excellence as "a well-established event in our national calendar". Now in its ninth year, the ceremony has distinguished itself for pioneering an initiative that finds the very best in British Muslims. Home Secretary Jacqui Smith said: "The Muslim News Awards are an important opportunity for us all to recognize and show our appreciation for the valuable contribution that British Muslims make to our shared society." The editor of The Muslim News and the main sponsor Ahmed J Versi said: "We began this event nine years ago because we believed that British Muslims have a lot to offer to British society. Nine years on, and the quality of nominations from our 150,000 readers show that British Muslims still have what it takes to be pioneering contributors to the common good." In a message, the Opposition Leader David Cameron said: "Over the years the Awards have firmly established themselves in the national calendar, and have helped us to celebrate the huge contribution which British Muslims make to each and every aspect of our society." The Liberal Democracts Leader Nick Clegg, who attended the event, said: "These prestigious awards not only provide an opportunity to acknowledge the excellence of the individual nominees in their respective fields, but they also encourage us to reflect upon the valuable social, cultural, and economic contribution made by the Muslim community in the UK." Figure 2: Professor El-Gomati addressing the assembly after he received the award. During this ceremony, Professor Mohamed El-Gomati, FIstP, FRMS, Professor of Electron optics and Nanotechnology at York University and Deputy Chairman of the Foundation for Science, Technology and Civilisation (FSTC), was awarded Fazlur Rahman Khan Award for Excellence in Engineering, Science and Technology. As an internationally renowned scientist and researcher based at York University, Professor Mohamed El-Gomati has written more than 180 articles, patents, and books. He has excelled in the field of novel instrumentation, developing and building several state-of-the-art instruments in surface analysis and microscopy. He has acted as a scientific referee to the British Government and UNESCO. Among his inventions are the world's first multi-spectral analytical microscope and the world's first parallel electron energy analyser for surface analysis. In his thank you speech, Professor El-Gomati referred to the excellent work done by the Foundation for Science, Technology and Civilisation, to which he is Deputy Chairman, and mentioned that throughout Muslim civilisation Muslim Scientists worked in harmony with Scholars of various other faiths. He particularly drew attention to Qusta ibn Luqa (worked in Baghdad in the 9th century), a Christian scholar in mathematics, medicine and mechanics, who even wrote a manual to Muslims on how to perform pilgrimage to Makkah (Hajj) hygienically. Hence it is not new for Muslims to live in harmony and respect with non-Muslims.